Today is a busy day with both the Crazy Cooking Challenge and the Secret Recipe Club scheduled at the same time. I have my Monday Muffin recipe ready to go, as well but I am holding it back, until tomorrow. It is always exciting, waiting to hear who our partners are going to be and I am delighted that mine is Shelby from The Lives and Loves of Grumpy's Honeybunch. My first reaction though, was that I have already cooked from Shelby's blog and I dropped a line to my team captain Jane from the Heritage Cook. Jane is the sweetest person and has such patience when I run into a little wall. Jane came back to me to tell me that Amanda from Amanda's Cookin' who started the Secret Recipe Club (3 cheers) didn't have a record of it. I looked back and sure enough, for another group, I had cooked from Shelby's blog but not for SRC so I am the lucky one to get a second chance. Now comes the real problem. Shelby has too many great recipes to emulate. I ran off a bunch of them and ended up making two of them, the other posted on My Sweet and Savory, and this one which we had for dinner, this past Friday. It was not easy making any decision. I still have a few recipes, I plan to make. Shelby's site is delightful and you can get to know her family when you visit. Go look at the guy, she does all this for. He must be fantastic. Mix 1/2 of the garlic and ginger with the soy sauce, Brown Sugar, Mirin, Sesame Oil, and 1 teaspoon cornstarch. Place chicken pieces in sauce and toss to coat. Marinate for at least 15 minutes. Mix remaining cornstarch with 1/3 cup of water and set aside. Heat large, non-stick skillet over high heat. Add 1 tablespoon olive oil and heat oil, add broccoli and stir fry 1-2 minutes. Add remaining ginger and garlic and red pepper flakes and two tablespoons of water; stir-fry another 30 seconds or so. Transfer broccoli mixture to a plate and set aside. Re-heat skillet and add another tablespoon of olive oil. 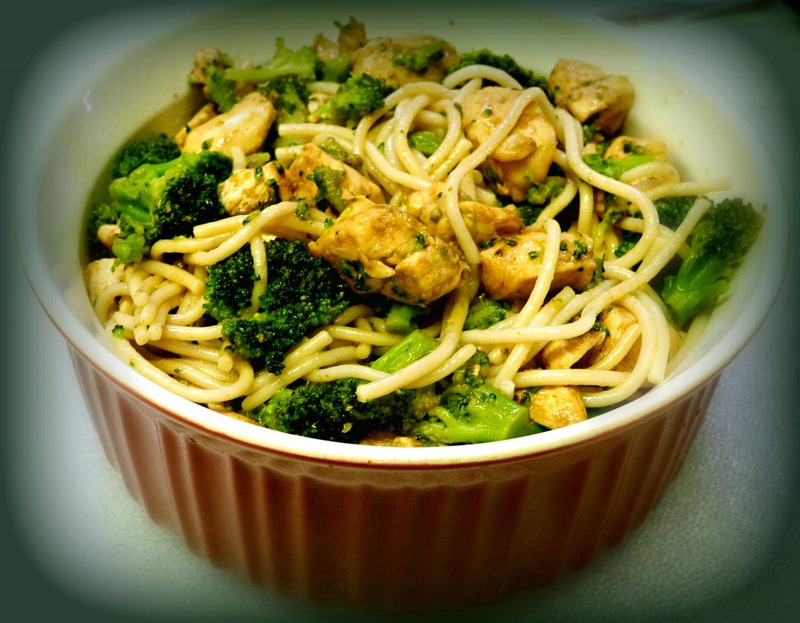 When oil is hot, add chicken mixture and stir fry until chicken is no longer pink. Add hoisin sauce and broccoli, toss to coat. Add remaining cornstarch mixture and stir until sauce thickens. Add hot noodles and toss to coat. Serve hot, sprinkle with more hot pepper flakes if desired. This is a wonderful stir fry. It's only morning but looking at it already makes me ready for lunch! What a great pick for SRC! Also, I just saw that you joined RecipeNewZ! Yey, thanks so much! I hope you like the site. Let me know what you think about it. This looks like such a great stir fry for dinner. Looks like I need to grab some broccoli! this sounds so flavorful and simple. great choice! Hmm, I think we've partnered in Taste & Create before haven't we? Looks like you did a great job! 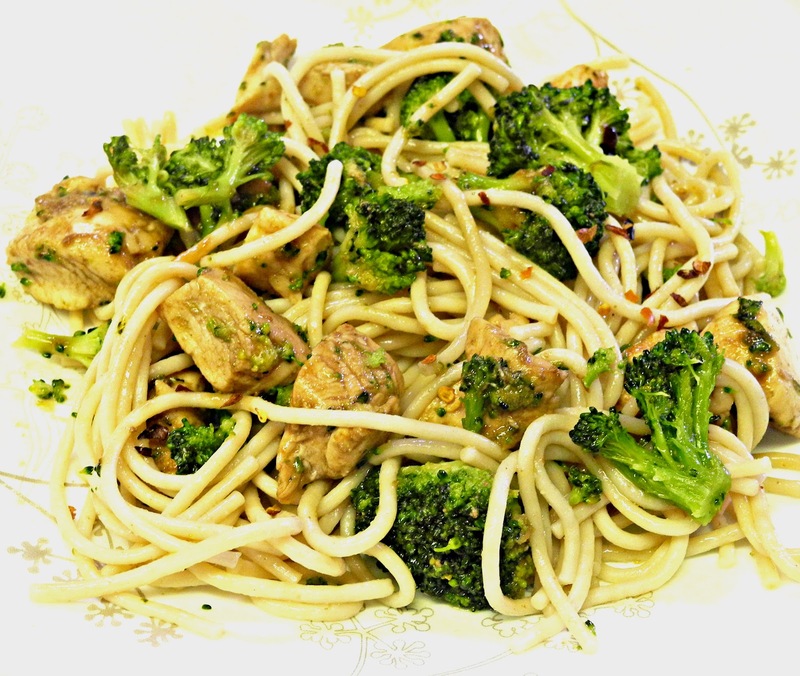 We love pasta with veggies and either chicken or seafood....or sausage links or beef. lol I guess we just love pasta! Thanks for sharing my other recipe on your other page too! This is a great example of the delicious, healthy meals Shelby has on her blog. Great choice. Visiting from Crazy Cooking Challenge and (by a happy coincidence) from SRC group D. This looks dee-licious! Yum I believe I make something like this often! The brown sugar is an interesting addition, I think I would like it against the sesame and mirin! Looks healthy! Shelby has a great looking blog! Yum, this looks fantastic. I have been turning to stir-frys more lately as a quick and tasty dinner option, and I really like the sound of this one! Nice job, I love Shelby's site. I was lucky enough to have her once myself. She has way too many yummy choices on her blog. This is a wonderful meal. I am such a huge fan of broccoli. It's just so tasty. Looks tasty! I've wanted to join SRC for a long time. Thanks for linking up! Looks delicious, especially on top of the pasta!